Q: How long have you worked as a Pool Trooper? I started eight years ago cleaning pools. I remember during my interview when Dave and Gary (the owners) explained that advancement was performance-based and had nothing to do with seniority. So I busted my tail for the first two months and then I was promoted to chemical technician. Proof, that if you work hard you get rewarded. After 11 months on the chemical route they made me a supervisor. Today, I’m an operating partner with part ownership stake in Southwestern Florida (Punta Gorda, Cape Coral, Fort Myers, and Naples). Personal growth is absolutely still based on hard work and performance and I wouldn’t have it any other way. In my case, to become an owner-operator I had to be willing to relocate. We’re constantly growing so there are always great opportunities if you’re flexible and work hard. The first thing you need to know is that it’s hard work. It really is. You have to do quality work and it’s not an easy job. 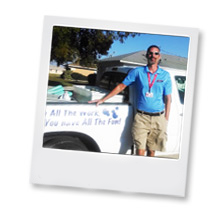 We don’t spot clean; we follow the same steps and procedures EVERY TIME we service a pool. You need excellent customer service skills. Obviously the right candidate has to be personable and well spoken. It’s hot out there – and when the customer comes out to check on things, you need to keep smiling. When you’re dealing with customers your demeanor definitely comes into play. Having integrity is key. You can’t skip on any of the elements of doing your job – the customer is paying your salary. The second thing you should know is that in our work environment we’re like one big family. Everyone’s got one another’s back. People feel welcome here right away. People are genuine – not just the supervisors, everyone. It’s a really unique experience and I think it surprises people when they first get here. I like making my customers happy. Sometimes it’s stressful but it makes me very proud. Most people just want someone to talk to them professionally and honestly. I love the challenge of turning a new customer into a customer for life. I love the fact that I get to be outdoors all day. I’m not an office guy. I love being out in the field and meeting lots of different people. I have customers who will text me random things – not even about their pool. I love that. Exactly what it states. If you need something or you’re in trouble, just know you can always contact us and we’re going to do whatever it takes to make things right. We do it daily. No one can do everything that needs to be done on their own – you have to have each other’s back. That goes for teammates and our customers. 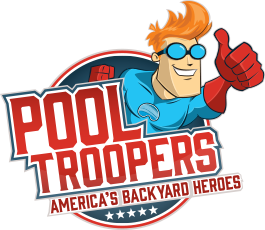 Q: Tell me what you appreciate most about working with Pool Troopers? From day one, I asked some very pointed questions about my career potential. Dave and Gary gave me their word that advancement would be based on performance and they stuck to it. I wouldn’t hesitate to tell new employees that if you work hard, if you love helping people and putting in a solid day’s work, advancement will happen – if that’s what you want. Freedom means everything to us. Lots of times you’re stuck in a rut in a job with no carrot or goal to go after, but Gary and Dave give us the freedom to manage our day, plan for our future and succeed. This is a career, it’s not just a job.